Twins general manager Thad Levine has not been secretive regarding his pursuit of top available pitching talent. He recognizes a need to bolster the front end of his rotation. In the Offseason Handbook, I wrote a blueprint suggesting that the Twins trade Ervin Santana and sign Yu Darvish to replace him as the club's veteran No. 1 starter. Today I'll dig deeper into the rationale behind dealing Santana, because while it's partially about clearing his 2018 salary to make a big-money signing more palatable, there are other factors to consider as well. First, let's acknowledge the obvious: Santana was spectacular in 2017. He had arguably the best season for a Twins starting pitcher since Johan left town. Big Erv made the All Star team, finished seventh in Cy Young voting, and buoyed an otherwise shaky rotation. But that's exactly why his value is at an all-time high. Historically, career years at the age of 34 don't often become trends, and Santana's in particular carried many indicators of being aided by luck (evidenced by a 4.46 FIP). He's still a reliable, proven workhorse and that's why he has value to any team – including the Twins – but right now his value is peaking. Derek Falvey talked when he came aboard about being "opportunistic," and this would be the definition. Santana has only one guaranteed year left on his contract, but here's the thing: His 2019 option triggers if he throws 200 innings next year. In the event he regresses to his FIP – or even his 4.02 career ERA – but still reaches that milestone, you're locked into him for $14 million at age 36, right in the middle of a peak window for winning with Byron Buxton and Co.
Santana's team-friendly contract can turn into a hindrance rather quickly. It might be easier to sell ownership on a $150 million splash for Darvish (already named by Levine as a priority target) if you can get that potential $27 million commitment to Santana off the books. And swapping out a 34-year-old with one/two years of team control for a 31-year-old with five/six makes plenty of sense in the greater team-building scheme. But even beyond the financials, there is an obvious sell-high angle at play here. Of course, other GMs will notice that as well. You can only be opportunistic if there are opportunities to exploit. Who might actually be interested in Santana, and at what price? In my mind, it won't be a World Series contender looking to add that final rotation piece. Many can afford to pursue a top free agent arm, and few would actually view the veteran starter as a meaningful upgrade to their playoff rotation. Instead, I look at teams trying to claw their way back into contention, and in desperate need of a veteran who can provide quality innings. My suggested match in the Handbook was the Cincinnati Reds, who have been withering away a Hall of Fame career for Joey Votto with three straight 90-loss seasons. There's pressure to get things turned around in a hurry, but the Reds aren't exactly positioned to go get Jake Arrieta. Santana would represent a modest financial commitment, and he'd immediately slot next to young fireballer Luis Castillo atop the rotation. Erv has been credited as a mentor in Minnesota – that factors as well with the 24-year-old Castillo being a fellow Dominican. In the blueprint I tossed out right-hander Robert Stephenson as a hypothetical return for Santana. He's a high-upside young pitcher, and former first-round pick, who has struggled with control thus far in the majors (5.10 ERA, 1.60 WHIP in 120 innings). He did, however, put together an excellent late run in the Cincy rotation. Given his organization's scarcity of promising arms, Stephenson might be asking too much. But he's just one name. The Reds have a number of prospects capable of enriching the Twins system. There's also Raisel Iglesias. Jon Morosi reported Minnesota's interest in the Reds closer a couple of weeks ago, and while it'd take plenty more to pry him loose (Romero? Gonsalves? ), Santana's presence might help move the needle. It's all speculation, of course, but therein lies the fun. Which other teams do you view as possible partners in a Santana trade? What would you be looking to get in return? Nice article,I tend to agree with this, just do not think it will happen. I had more of an idea of offering Santana a 2 year extension for $25M. The idea of trading off Santana doesn't make sense unless you think he'll turn into a pumpkin - in which case you should also think he has no trade value, esp to rebuilding teams that should horde younger players. If you think Santana can pitch about 190 innings next year with a ERA+ of around 100 then you should keep him because we don't have five pitchers that will beat that. He's not blocking anyone and the Twins window is currently open. They shouldn't worry about 2019 when they should be worrying about 2018. And if you think ownership is worried about paying a 36 year old pitcher 14m then how are you going to convince the same owner to pay Darvish 25m per year for his 35-37 years? So we solve our pitching problem by trading away our only proven pitcher? Sounds like a good plan for 2020. No thanks, I've waited long enough. Plus, IMO, Darvish isn't that much better than Erv. It's taking one step back to move two steps forward. I'm on board if they can by some miracle sign Darvish. I can't see the Twins committing that kind of money to a FA but if moving Santana will pry the wallet open enough to sign Darvish I certainly make that move. The only part of the plan I'm not crazy about is moving Gonsalves for a bullpen piece. The idea will get a lot of heat but the reality is this team operates under a self imposed cap. They aren't bringing on money without cutting out "expensive," players. They do desperately need a front end starter (maybe a couple) and the only way that's happening is by gutting the farm or trading MLB talent. Moving on from a 34 year old Santana may sting the most right now but long term I think it's the least painful option. -What do we try to trade for? Our biggest two needs are starting pitching and bullpen help. Nobody is going to trade a better starter for Ervin, so we're looking at relievers. No thanks. You need someone to pitch 6-7 innings to give a winnable game to the bullpen in the first place. I don't think you can convince me than any reasonable bullpen trade target would be more beneficial than Ervin. You could argue we could use a solid DH bat, but we already have that filled with Sano or Escobar. So what are we trading for and how do we actually use what we trade for without benching someone that should be starting? Thank you for writing what will probably be a very unpopular question. Ervin is rock solid, had a great year. If anyone looks at his advance stats over his career, this is not a person who will probably duplicate another year quite like this. I love Ervin, think he's a gamer, but I like this whole line of thinking. If the Twins are sincere about adding starting pitching that is younger and potentially better, I am on board with this. I will say Phil Huges' year might have been better, and he was much younger (without the track record of Erv), but it was a great year to contradict what you said about Erv. I just think our roster needs some outside of the box thinking and that's why I like this article. Gunathor's devils advocacy is well advised, but I think the Twins might make an ok splash in free agency, and I believe in Trevor May as a starer. We will see. All great speculation though. I am a firm believer that teams should not "swap out" the pitcher at the top of their rotation. An example--although not a parallel in terms of the quality of pitchers being compared to in this case Darvish and E Santana--is when, a few years ago, the Phillies traded for Roy Halladay and then, a day later, traded Cliff Lee. So were the Phillies then sizeably, appreciably better? No. Their GM at the time all but admitted that. Back to the Twins. The rotation, by all accounts, is a weak spot. Signing Yu Darvish would improve it. But then trading away the one tried and true dependable holdover puts us more or less back where we started: with only one tried and true veteran starter. So it is a simple case of aďdition combined with subtraction leaving you still high and dry. Why would any team acquire Santana while giving up pitching? 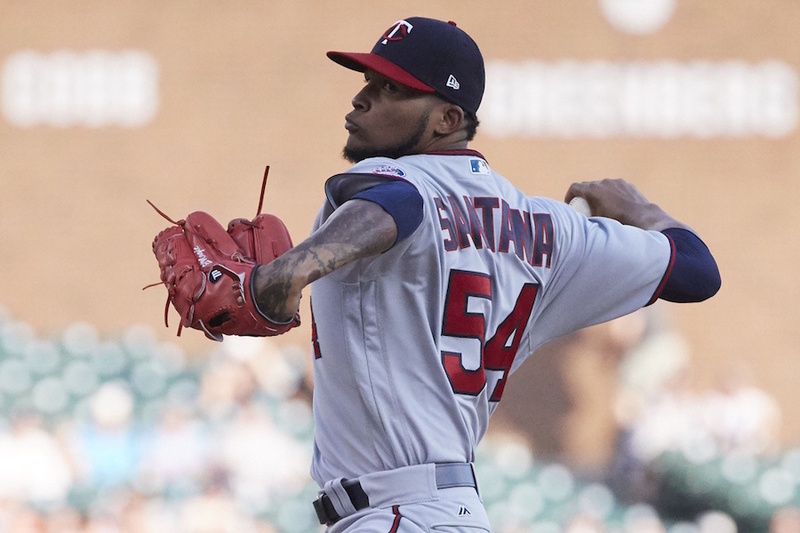 Santana has more value to the pitching-hungry Twins than other pitching-hungry teams, as the Twins are closer to contention. The teams that are more competitive than the Twins, seek better pitchers than Santana, and would rather give up dollars than player-assets. The only kind of trade I could see working would involve the Twins taking on money, say Santana, etc. for Price or Lester, who have their own warts and far worse contracts. Trade our best pitcher?Why are some people obsessed with being in constant rebuilding mode?What's wrong with keeping a few of the good pieces? Santana's the best ace we've had since Johan Santana and there's no reason to shop him unless the Twins are cellar-dwelling at the trade deadline midseason. What's next? Flip Buxton for prospects? Evan as a discussion piece I can see the logic in this.Do not think it is likely, but the suggested possible trade to the Reds for either piece makes some sense.If you are coupling that with signing or trading for another #2, #3 starter it makes a lot of sense. Santana's numbers under the ERA suggest he may be a significant regression piece, and since I (and a number of other posters on this site) do not trust Gibson who has had good stretches before.Twins need to be aggressive in pursuit of pitching,but as TR found out, you cannot force players to come here. Would think some moves would start happening. I don't think this is a bad idea. The Twins should look at all angles to improve their team, and that could include a Santana trade. Trades you don't have to make are the best types, because you can command higher prices. At the same time, having Santana as a No. 3 starter instead of a No. 1 starter is a much better rotation. But if the Twins enter 2018 with a better rotation, I'm all for it. This is probably the most practical option unless someone blows your socks off with a killer offer for him. Santana was spectacular in 2017. He had arguably the best season for a Twins starting pitcher since Johan left town. That said, I totally agree with the rest:Santana needs to go.That ERA-FIP difference, the facts that he was not consistent but had an extremely unreliable June (6.03 ERA) and July (4.68 ERA), he is half a ligament away from disaster, and very likely his 2019 option will vest with IP in 2018, makes it a must to get him traded.Plus he chocked when it really mattered in the postseason. Package him with Dozier and see what you get. If you could sign Darvish and Ohtanni, then trade Santana, I'd be OK with it. If you had to trade away Santana to open up the wallet first, my concern would be the last player standing without a chair and being forced into making a bad trade to give up too many prospects. I find all the discussion about Darvish to be fascinating.His 162 game average is 15 - 11 with a 3.42 ERA after five seasons and an average of 3.9 WAR with one season of 5.8 pulling the average up. Santana was 16 - 8 with a 3.28 ERA - his career average is 4, but who is to say that with our defense it is going to rise to 4 again?His 162 game average after 13 years is 13 -11 with 4.02 ERA and a 2.4 WAR. Not equal, but is Darvish the one we saw in Texas or LA?His line suggests that he peaked early and is not the pitcher we saw when he came to Texas.Will he age well? I am not as excited as others about Darvish - if we sign him that is fine, if we trade Santana to acquire Darvish we have stayed in the same place we are now. Interesting idea Nick. Like others, I’d be on board if, and only if, the Twins ended up adding two good starters as a result. Trading Santana and signing Darvish makes little sense to me. Trading Santana, while adding Darvish and Cole, or Darvish and Ohtani? Ok.
1. Whoever my 5 starters are to start the year, one of them goes down for the season. 2. Two starters simultaneously are out with injuries for a few consecutive starts. 3. Gibson, May, Mejia, Hughes, Gonsalves, Sleger. I'm not counting on ANY of these guys. Every one of them poses meaningful risk. The only question is, how many of these guys can I plug in on the basis of informed hope? Two? Three seems like the outside limit and a huge risk. Santana, Berrios, Gibson, Mejia, and May. (Who am I missing?) One goes down for the year, and two are out at the same time for a stretch, meaning Gonsalves and Slegers come up. The point: We're operating, right now, with AT LEAST a two-starter deficit, and both are front end deficits if you're contending. Darvish, Otani, and Cole. Then we'll talk about a meager surplus rather than a massive deficit. They havea team option that vests with 200 IP in 2018 for $14M. Something I've occasionally wondered is whether the team has any choice, if the option doesn't vest. Say he pitches 165 innings but the team is happy with him and wants to pay the $14M for the next season, can they execute the option anyway, or is the option voided automatically and negotiation goes like for any free agent? I am not a huge fan of this idea but in certain circumstances could see it making sense. If the Twins have already acquired 2 rotation pieces and trading Santana can bring them a closer then yes, I’d go for that. I believe they are targeting Darvish as an incentive for Ohtani and if that gets them both players then great. If they sign Darvish and don’t get Ohtani, then try trading Santana for a younger pitcher with some controllable years they will have to throw in something else. If that something else is one of our top tier pitching prospects then I’d be solidly aigainst it. That would be to high a cost for anyone not the next Kershaw(I’d be ok with that if it was for Kershaw). It is a team option, so Twins have control. It is automatically exercised if he hits 200 ip next year. $1mil buyout. I would add, if Santana hits 200 ip next year, $14mil for 2019 will not be a burden (barring a massive injury after he hits the 200 ip mark). I don't understand the logic in trading Santana unless it is just one move in a series of moves. and the option year shouldn't matter, except that the Twins should hope he is good enough to pitch 200 innings and we get a decent pitcher for 14 million the following year which I guarantee we couldn't get back on the open market. Assumption - other GMs are not idiots. Other GMs understand good/bad seasons, peak and low values, and age affecting performance. No one is trading younger pitching (close to the Majors) for Santana. Santana has strong value for the Twins and you make a decision at the trading deadline when a contender may be desperate for a starter (see Garcia trade).